While there is unquestionably plenty of toilet humor in the Grand Theft Auto series and most of the subject matter is somewhat low-brow, many references are downright brilliant, and aimed at the sharp cookies who play the games. Richard Dawkins is one of the most famous scientists out there, and also ranks among the most outspoken. He’s a biologist and one of the leading authors on the topic of evolution, and has plenty to say about atheism as well. He is also the founder of the term meme, which he meant to refer to something like a human gene but with regard to behavior, rather than cat picture on the internet. 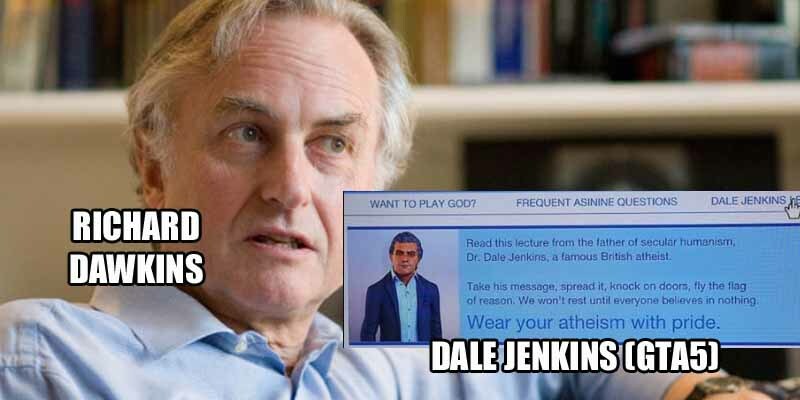 There is a website in GTA V called acceptthechaos.com, which was started by Dale Jenkins, a prominent British atheist in the GTA world, who looks an awful lot like Mr. Dawkins.